IP has now come of age and many broadcasters are looking to transition to ST2110. The Broadcast Bridge has been championing IP education and in this unprecedented IP seminar they have brought together leading industry experts to deliver an in-depth case-study of the world’s leading ST2110 IP installation at NEP Australia. Paul Harding of NEP will discuss his experiences of making ST2110 work in a live, real-time IP environment. From non-blocking Ethernet switches to PTP timing, Paul will dig deep and explain how to make ST2110 systems work effectively to gain the COTS advantages everybody is looking to achieve. Delivering ST2110 in real-time live environments is significantly different from the incumbent SDI and AES systems. IP packets are delivered over an asynchronous shared network, unlike SDI and AES as they operate in well-defined synchronous systems. Although SDI and AES systems are reliable, they are static and often challenging to change. New video formats are difficult to integrate as the sample clock rates are intrinsically linked to the network. And maintaining frame accurate metadata and lip-sync can easily become complex, further adding to convoluted and troublesome workflows. ST2110 abstracts away the video, audio, and metadata essence from the underlying transport stream and frees broadcasters from the static networks of the past. IP packets traverse through dynamic Ethernet networks to deliver scalable, flexible, and format independent systems to future proof broadcasters for years to come. To achieve dynamic, adaptable networks, ST2110 employs Precision Timing Protocol. This replaces the traditional line, field and framing signals of the past to allow video, audio, and metadata essence to be processed independently of each other. Thus, making broadcast systems truly flexible and scalable. Furthermore, as new formats become available, such as 4K and 8K, they can be easily integrated into an IP and Ethernet network as the packet switched system has no knowledge of the information transported in the payload of the packets. There are further advantages when building multi-framerate systems. Unlike SDI systems, IP networks do not need to be aware of the frame rates transferred within the network. But understanding the theory will only get us so far. To make an ST2110 system work effectively, engineers need access to leading industry experts who have already made these systems work. To address this, The Broadcast Bridge has built on its years of education and knowledge sharing of video, audio, and metadata over IP, to bring together trail blazers from NEP, Lawo, Arista, Meinberg and Sony, who all played critical roles in making NEP Australia’s Andrews Hub work. Each will talk about their technology contribution and how to design and build world class multi-vendor ST2110 IP facilities. This exclusive one-day seminar is the event of the year for anybody looking to transition to IP or for those needing to deliver cutting edge products and services for the ST2110 infrastructures of the future. 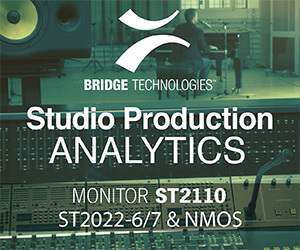 Held at the prestigious BAFTA Princess Anne theatre in Piccadilly, London, on 26 th March, this exclusive ST2110 education day is a must for anybody looking to migrate to ST2110 or build ST2110 products and services. The whole day is dedicated to gaining understanding beyond the theory. 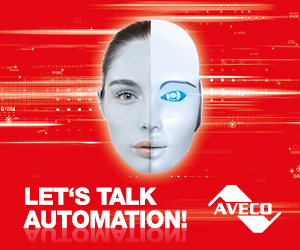 It’s dedicated to sharing knowledge and information to help you deliver ST2110 systems. Breakfast, lunch and refreshments will be served. Places are limited due to the size of the venue. Register now to guarantee your place. Behind the more than 100 television cameras and an arsenal of the most advanced broadcast technology ever assembled, the anchors reporting the 53rd Super Bowl will concentrate on the ancient art of storytelling. During Super Bowl LIII, the football action will be on the field. But a lot of the action will be enhanced by incredible new graphics, some virtual, that CBS is using to super charge the screen. 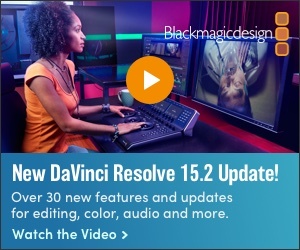 We editors, color graders and graphics artists are an opinionated group and that’s a good thing because with the speed technology is changing we need open communication among ourselves.